The list of artists whose music actually moves me — breath caught in my throat, caught up in the story the lyrics tell, maybe even a little teary-eyed over a song or two — is pretty short. You can probably guess most of the members of this elite club, as they’re frequent subjects on this site. Shows from these artists are always difficult for me to write about, because it’s hard for me to separate out my feelings and all the reasons why I’m so moved, in order to give you something a little more objective to read. But we’ll give it a try this time around. 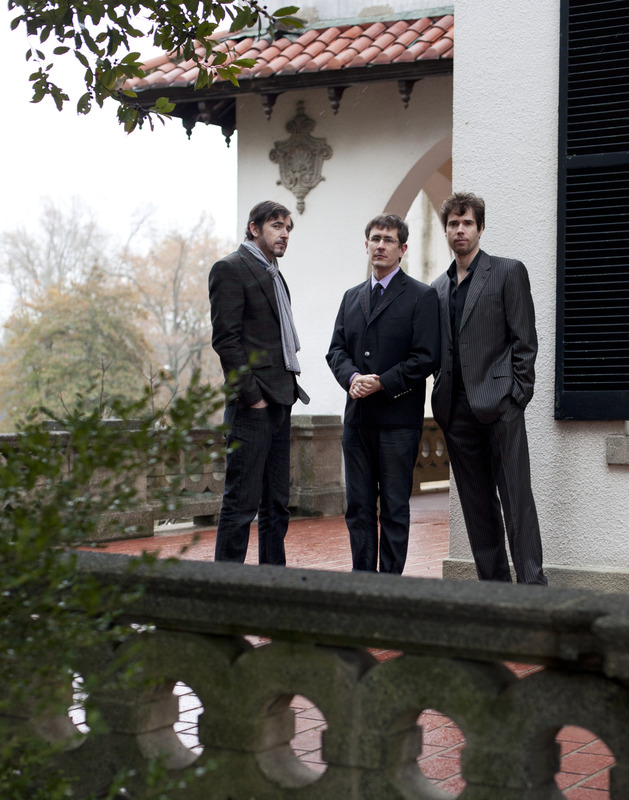 Anyhow, over the past few years, the Mountain Goats have wormed their way onto that list, and this week’s show, though short due to Chicago curfew laws (the show was all-ages), really helped reinforce that they absolutely belong there. Though touring for their latest album, All Eternals Deck, John Darnielle and company (Peter Hughes on bass, Jon Wurster on percussion, and Yuval Semo on keyboards/guitar) certainly didn’t let the new songs take over the show. Darnielle’s back catalog includes hundreds of songs and extends to the early 90s, when The Mountain Goats were largely a solo endeavor and Darnielle was a lo-fi darling. Armed with a full band, however, songs that were formerly sparse and stark took on a whole new life. The thing that always strikes me the most about a Mountain Goats show is the sheer amount of joy you’re confronted with. It doesn’t matter if the song is about a doomed marriage, suicide, bullying, addiction, or any other less-than-cheerful topic; there’s always a palpable sense of enthusiasm on stage from Darnielle and company that makes it very easy to have a good time. Darnielle is so earnest in his song delivery and his banter with the crowd that he’s impossible not to like. He is an unlikely frontman but he plays the role well, even if he does need to take his glasses off to headbang for a few beats. While the new songs from All Eternals Deck got a great reaction from the crowd, especially “Damn These Vampires”, it was the older tracks which provided some of the most memorable moments of the evening for me. “Family Happiness”, introduced as “a story about a couple of people in a car”, was delivered with a fiery intensity that grabbed my attention immediately. The lines “look at the person I’ve turned into, tell me, how do you like him now?” are ones which really made the song stick in my head. “You can arm me to the teeth, you can’t make me go to war,” Darnielle sings, and you can easily deconstruct the dysfunctional relationship of these travelers, both of whom think “the only way out is to eat the other one”. “Home Again Garden Grove” was a highlight mentioned in just about every review I’ve read of the show, the formerly acoustic song taking on a new urgency with the addition of a full band. Unreleased track “You Were Cool” was a touching song about pushing on through your teenage years and coming out on the other side. “I hope you love your life like I love mine, I hope the painful memories only flex their power over you a little of the time,” the song goes, and anyone who has ever had a less than stellar adolescence sighs a collective sigh. The show even had a special guest: lately, the Mountain Goats have been covering “Plain” by Silkworm; here in Chicago, the lead singer of Silkworm, Tim Midgett, came out to sing his own song, backed up by the Mountain Goats. Darnielle had a huge fanboy moment after that, and it just put a smile on my face to see a musician being excited about the music of others. It’s one thing to thank an opening band or collaborator; it’s another to be as obviously full of glee as he was. What always brings me back to the Mountain Goats — me and all of the other thousand-some fans in attendance, I’m guessing — is that no matter how cryptic the song, there’s always something in there that you can relate to. You’ve been one half of the couple in the car, fighting tooth and nail to outlast your partner. You’ve been one half of that couple that really needs to call it quits, but are too stubborn or too stupid or too proud to follow through. You’ve been the awkward teenager wondering if things will ever get better. You’ve told yourself, over and over again, even on the darkest of days, that you’re going to make it through this year, even if it kills you. I’ve certainly been there. Maybe you have, too. That’s why I love this band. There’s a message in there that you can identify with, without the message being too heavy-handed. I went to the show expecting to rock out a little bit, and I left feeling uplifted and encouraged. Yes, I am going to make it through this year, and so are you. Openers Megafaun, a North Carolina-by-way-of-Wisconsin trio, easily won the attention of the crowd, and brought with them a self-deprecating sense of humor that likely played well with the amassed Mountain Goats fans. Not many openers can get their audiences to pay attention to them, let alone to sing in three part choral harmony, but Megafaun succeeded easily. I look forward to exploring more of their music; hopefully, they’ll swing by Chicago again in the future on a tour of their own, hopefully in a smaller venue. At least one recording of the show has surfaced over at Archive.org, so you can listen for yourself. Both 16-bit and 24-bit recordings are available. Both links offer MP3s and streaming audio, in addition to the FLAC files.